In less urban areas, property boundary lines and their corner markers are often lost. Trees fall or are logged, slopes give way, streams erode banks, and all of nature conspires to make marks on the ground disappear. California real estate disputes often hinge on locating a property line on the ground through rugged terrain. Real Estate and property attorneys advise their clients that a survey will be required -and it is best for the parties to share the cost of the survey. However, if the value is high enough, there may be competing surveys with different results. Such was the situation in a recent decision out of Santa Cruz, where the parties disputed who owned some redwood trees. In Jacques Bloxham v. Todd Salinger, the parties owned adjoin parcels with a common boundary line in Soquel Creek. Neither surveyor was able to locate the North and South Corners of the common property line. They reviewed the field notes of the original survey, which took place 150 years ago. They did locate a “witness tree” stump (the tree had been logged). 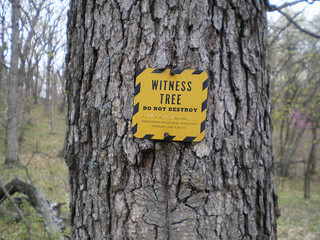 A witness tree is one which has been blazed, is near a corner, it is located at a specific distance and bearing from the corner. If you know the distance and bearing, you can locate where the corner was by measuring from the witness tree. They also find “line trees” -trees directly on the line, indicated by blazes. In determining who was correct, the Court of Appeals went through the numerous rules regarding land surveying, including California statutes, and the Manual of Surveying Instructions, which is published by the Bureau of Land management. First of all, the location of a disputed boundary line is proven by retracing, as nearly as possible based upon existing evidence, the footsteps of the original surveyor who made the last-accepted government survey and place the corners and lines where they were placed by him. Here, were the last survey was conduction in the 1850’s, an expert witness established that compasses of that time were capable of measuring accurately to a quarter of a degree, which meant that there could be a discrepancy of plus or minus 15 minutes, as measured from a witness tree. Thus, there will be some slack in relocating the corner today. These are specifically defined terms in the Manual of Survey Instructions. A lost corner is a point of a survey whose position cannot be determined, beyond reasonable doubt, either from traces of the original marks or from acceptable evidence or testimony that bears upon the original position, and whose location can be restored only by reference to one or more interdependent corners. An obliterated corner is a corner that can be established beyond a reasonable doubt even though the corner and its accessories have been lost. 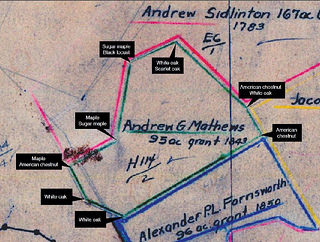 Its position can be located by the acts and testimony of interested landowners, competent evidence, necessary records in order to show where the corner was actually located on the ground by the creating surveyor. The winning surveyor here determined that the corners were lost corners, because they could not be reestablished without reasonable doubt; but he was able to set corners within 10 to 15 feet of the original corners. He established them based on locations of the witness stumps, and line tree stumps, which he could physically locate. He was in the vicinity of the footsteps of the original surveyor, relying on indicators on the ground. The decision did not detail the efforts of the other surveyor, but concluded that this surveyor followed the law, and that the trial judge ruled in his favor based on weighing the evidence. In other words, the other party did not establish that his survey was contrary to law.